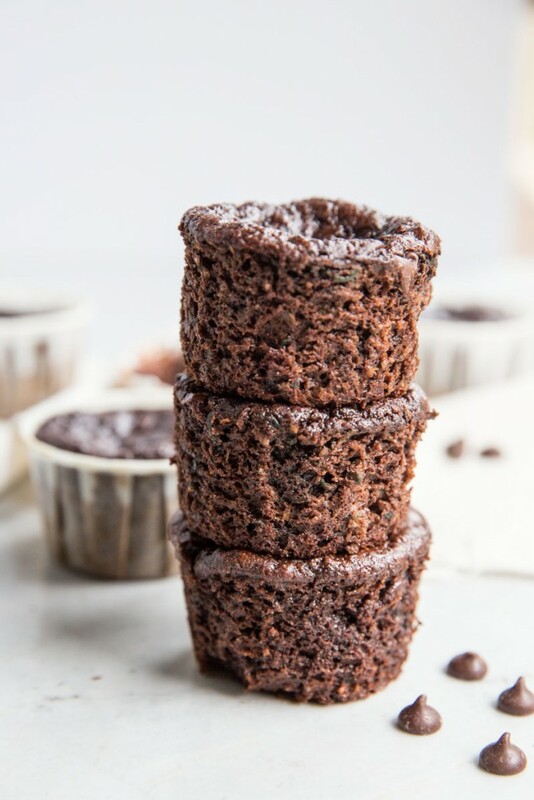 These Paleo and Gluten Free Chocolate Brownie Muffins have all of the ingredients for a healthy, guilt free dessert. I put them into my ‘everyday dessert’ category, which just means I enjoy these without any excuse on a daily basis. Yep, you’re going to need to double this recipe if you want to have any to share!! First I must give credit where it’s due. My mother in law shared this recipe with me after a recent visit we had to Texas. She, like me, enjoys her desserts! After a recent trouble with her health she’s had to get creative in the kitchen to find ingredients that her body will enjoy as much as her mind. 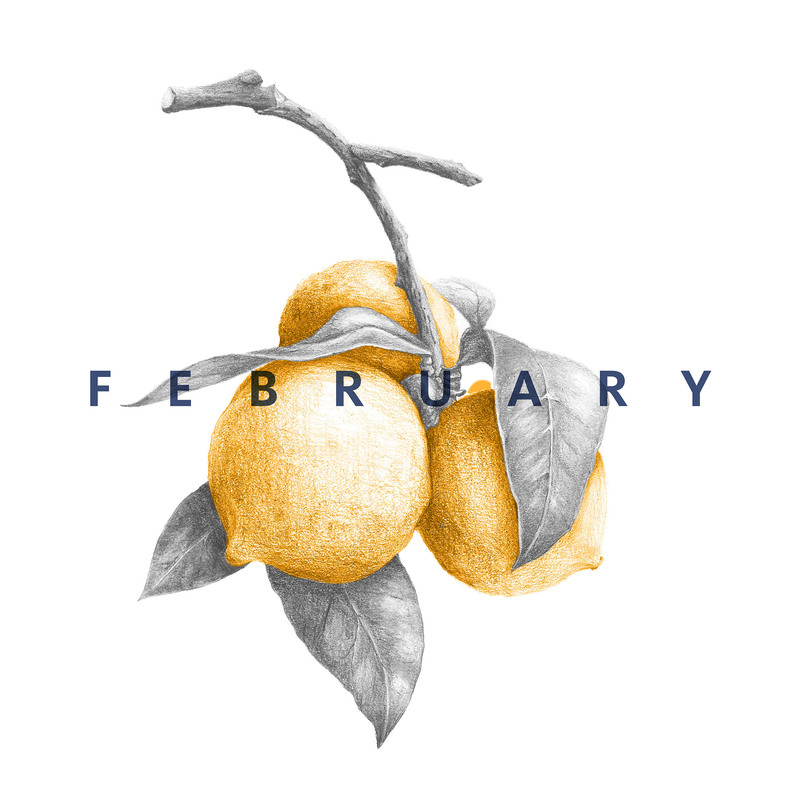 She used to be known for her Lemon Poppyseed Bread, Cinnamon Rolls, and Cherry Cheesecake but all of that had to end when her health took a tole on her. After a season of no sweets, she was able to reintroduce a few healthy treats back into her diet. 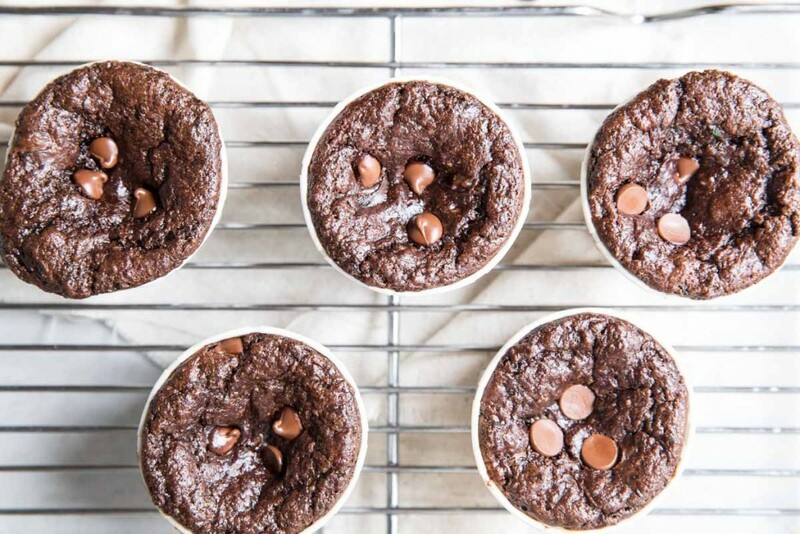 Then came these healthy brownie muffins! Over our visit I had several of these muffins! They are perfect to end the day with or as an afternoon snack. 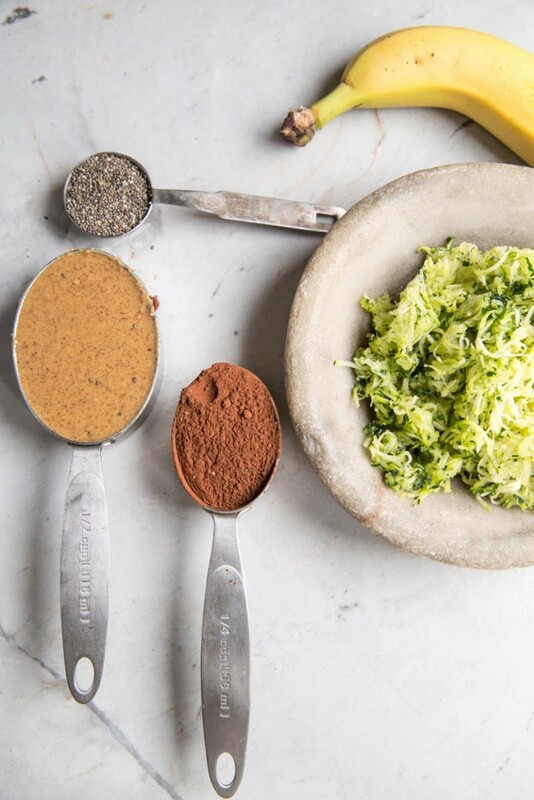 Because they are chalked full of healthy ingredients like zucchini, banana, chia seeds, and almond butter, you’re feeding your body with protein, healthy fats, and nutrients, while also completely, unreservedly having a treat. I kid you not, these are a real treat! 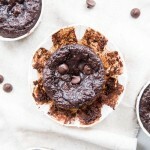 For a pure paleo version use paleo chocolate chips (try the brand Enjoy Life). Sugar free, salted, almond butter is best and raw honey along with raw cacao powder. 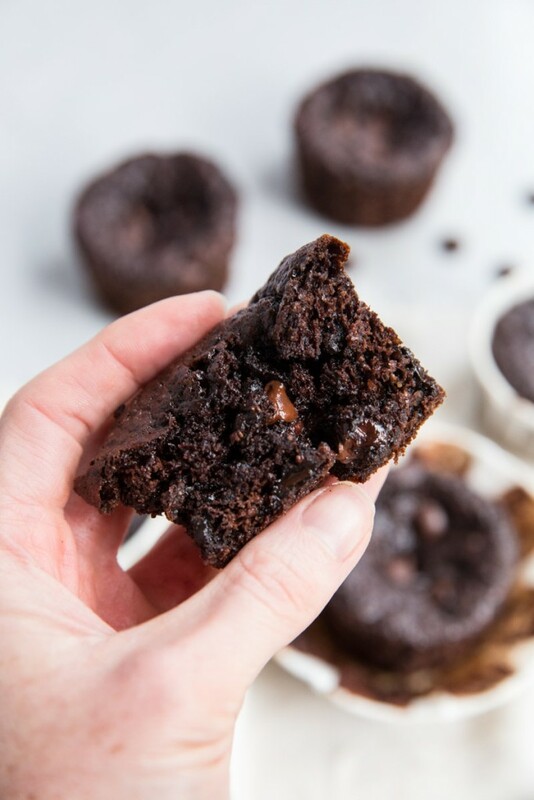 If you don’t mind going a little stray from the pure paleo version, you can use local honey, dutch processed cocoa powder (sugar free) and chopped dark chocolate. The muffins will turn out well either way. The chia seeds are optional. Without them the muffins are more dense and with them they are more light and fluffy since the seeds absorb some moisture. 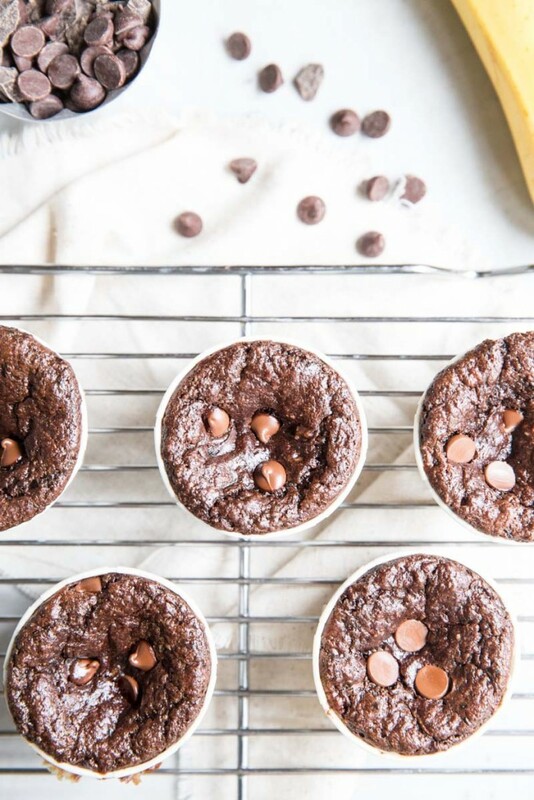 We all need a few dessert recipes that can be indulged without any guilt, on a regular basis! So here’s my little gift to you! Thank you Lana for sharing this happy sweet with me! 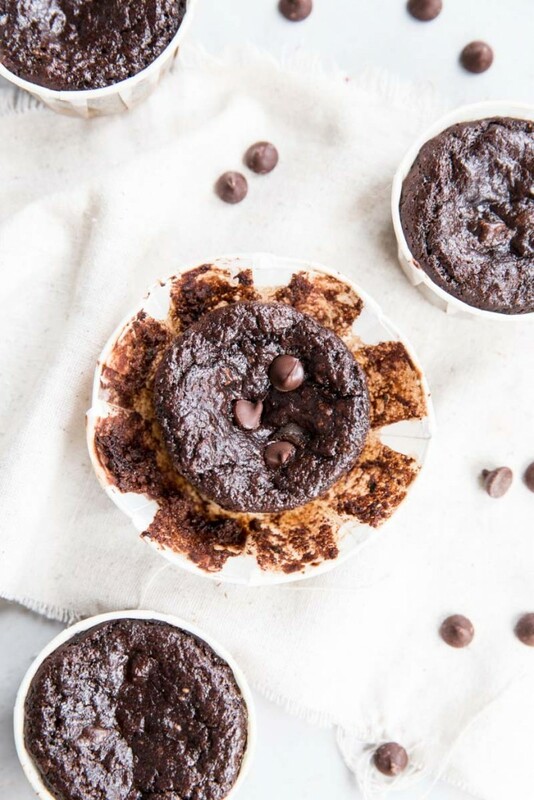 These Paleo Chocolate Brownie Muffins are the perfect gluten free, refined sugar free, everyday dessert to enjoy without any guilt! 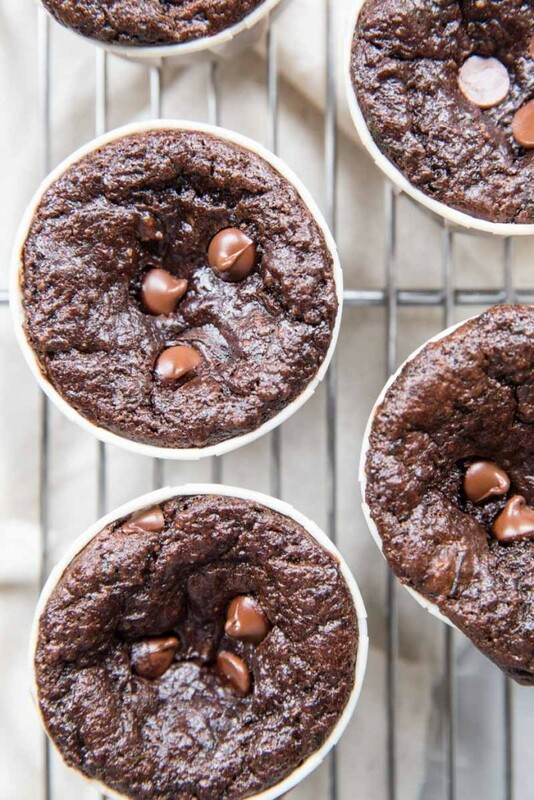 Preheat oven to 375 and line a muffin pan with 10 baking cups (I use paper or silicon for this recipe). If using paper cups, spray the liners with coconut oil baking spray. 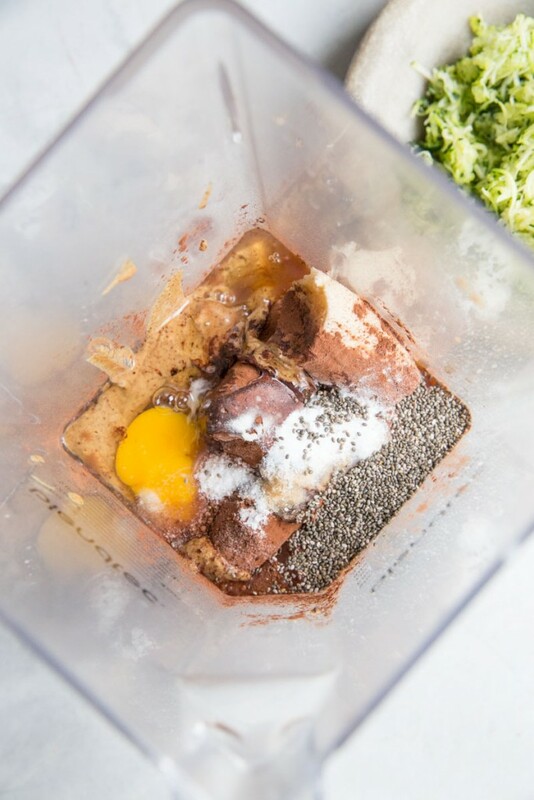 In a high powered blender, combine all of the ingredients except the zucchini and chocolate chips. Combine until smooth then add in the zucchini (squeezed of an excess liquid before adding). Stir in the chocolate chips. Spoon out the batter into the prepared baking cups about 3/4 full. This fills 10 cups or 12 for smaller muffins. Bake for 20 minutes at 375. Cool in pan and store in an sir tight container in the fridge. The recipe works with or without the chia seeds (a little more dense without them and fluffy with them since they soak up the liquid). For paleo chocolate chips try the brand - Enjoy Life. I’m so glad you love the muffins! Yours are prettier than mine! I made them a few times to try and make them pretty to photograph… sometimes the most delicious things don’t photograph well 🙂 love you and thanks again for the recipe! I’ve already had several friends make them! I don’t have any zucchini but I think I am going to sub cauliflower. I bet it works! Reporting back. Cauliflower is a fine substitute for the zucchini! I also added 1/4 cup of almond flour and 1/4 cup rolled oats! I hope your mother-in-law would approve!! These came out perfectly with those changes. You know, can’t leave a recipe alone me. 😉 Robbie loves them! LOVE this! Thanks so much! I will let my mother in law know! She always keeps almond flour and oats on hand. I bet they are more muffin like and less fudge with those changes. 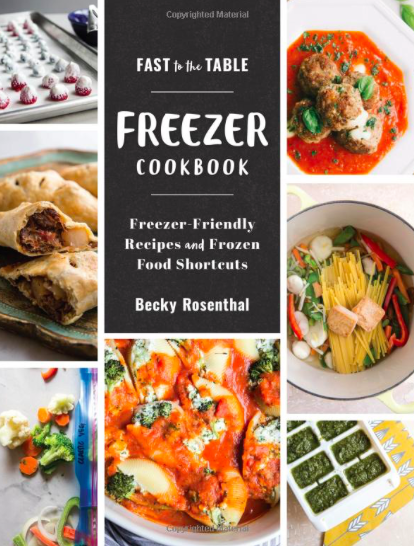 What a great treat, Becky! I will try them as soon as possible! I hope you do!! Let me know what you think! Thanks so much for stopping by my blog! My question is for Letty. When you add the almond flour and rolled oats did you have to change anything else in the recipe?